We're artists, scientists, engineers, educators, advocates, parents and a family. Based in Denver, Colorado, we're a small organization striving to make a big impact! Our goal is simple, yet powerful - we work to transform life-learning through STEAM & Maker experiences. Since 2002, our passion has galvanized an innovative series of programs, curricula and engagements integrating disciplines and communities. As award-winning developers, designers and creative consultants, we strive to unite the arts, sciences and humanities with a focus on collective discovery for all. Our Eurekus initiative is a result of collaboration - artists, scientists, engineers and educators working together to enrich learning in new and dynamic ways. Each year, we mentor thousands of students and teachers, exploring STEAM and Maker leading and learning. We partner with NASA, non-profits, schools, colleges, libraries and museums nation-wide to inspire both hands and minds. We explore content through imagination while encouraging inquiry and collaboration - striving to empower creative, global thinkers and stewards. We were founded by nationally acclaimed working and teaching artists, Tyler and Monica Aiello. Since 2003, the Aiellos have pioneered innovative STEAM initiatives - science, technology, engineering, arts & math - before the movement was even recognized. The couple spent many years forging collaborations among the scientific, cultural and educational communities. They started by developing K-12 in-class and after school programs in their hometown of Denver, Colorado as Da Vinci Club. 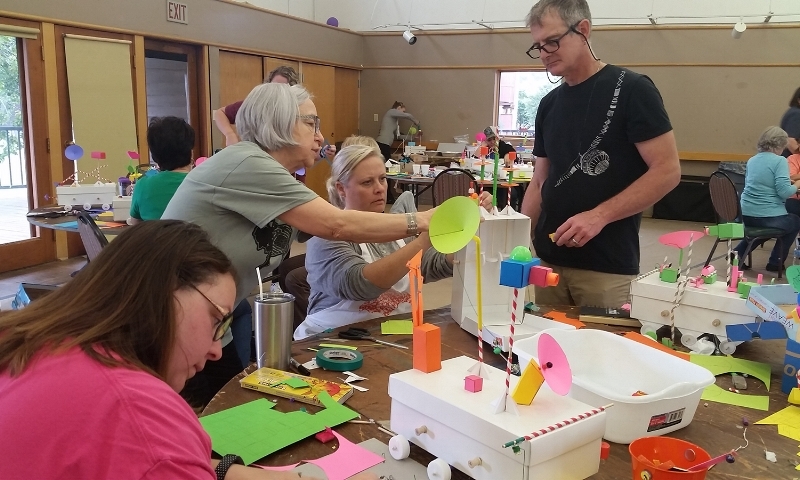 They also explored the nexus of art and science through exhibitions and community programs at their award-winning gallery, Studio Aiello and community maker facility, the TarFactory. Since, the Aiellos have empowered discovery and expression for thousands of kids, teachers, adult learners, organizations and communities. In 2014, we were re-branded under the umbrella Eurekus as we planned for expanded programs and our online shop. "Eurekus" was coined by the Aiello's 12 year old son and symbolizes "discovering together." Fable has it that Archimedes, the great thinker from ancient Greece, would exclaim "Eureka!" when having and epiphany in his lab. Our vision is to foster many "Eurekus Moments" in tandem with our mentors, students and partners. Although we created a new name, our vision and mission has remained the same, born from the passion for exploring ideas, sharing experiences, building community and facilitating the creativity of others.